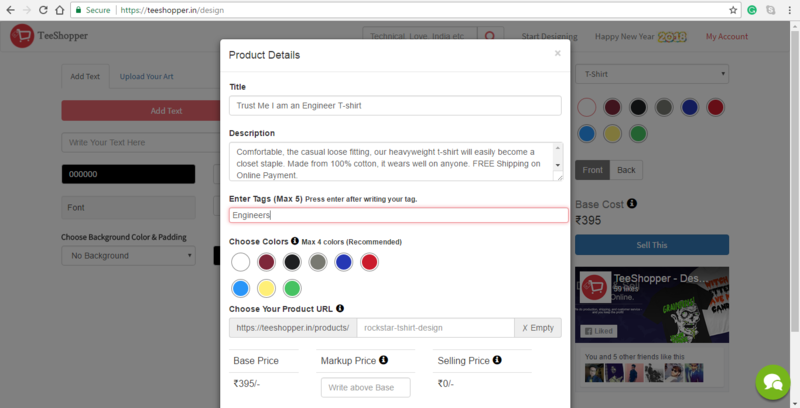 How to Add Tags to your Product Design? Tagging is one of the most important ways to rank your design in Google or TeeShopper search results. Tags help users find your design when they search on Google or in TeeShopper. When users type keywords related to your tags your product design will appear in their search results. After completing your design click on Sell This button which is on the right side below Base Cost. 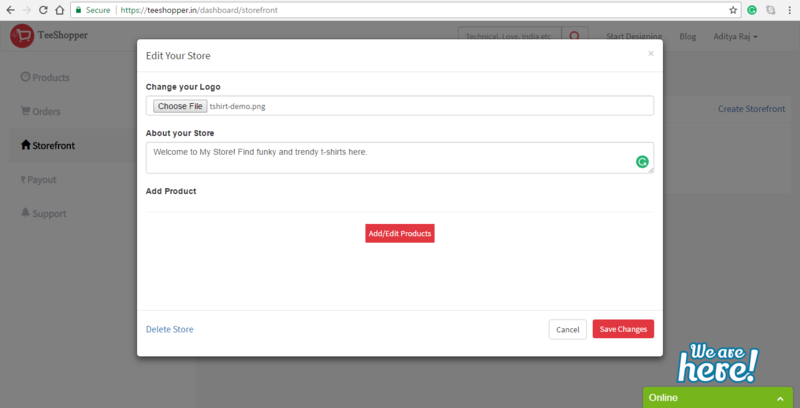 A dialog will appear, fill the details like title and description then click on tag box. Write any word related to your design. Ex – If I have made a t-shirt for engineers so I can give tag like “Engineers”, “IIT”, “computer”, “electrical”, “civil”, “mechanical”, “science”, etc. After writing any tag hit the enter button which is on your keyboard. Voila, It is added. Repeat the same to add more tags like this. We would like to introduce you our new Storefront. Now, you can list all your designs on one single page and have a custom name and URL. And easily share your store link with your buyers. Recently, our study found that people visiting storefront are more likely to buy your products compare to single links. Click on Blue Get Started Button and enter your desired store Name. 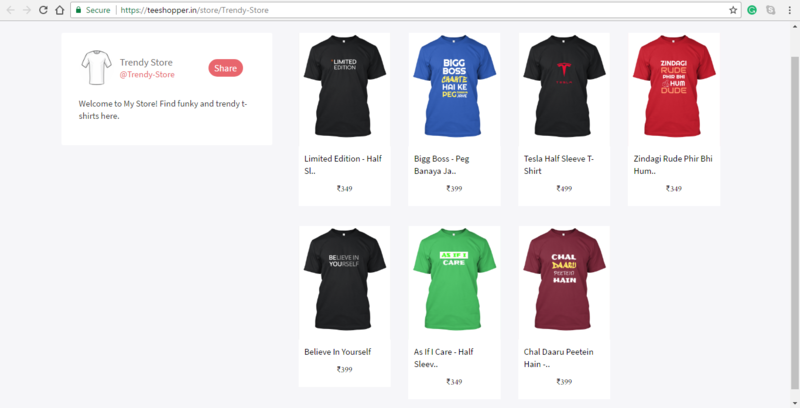 I design Trendy T-shirts, so I gave my Store name “Trendy Store” But you can give any name that you want to share to world. 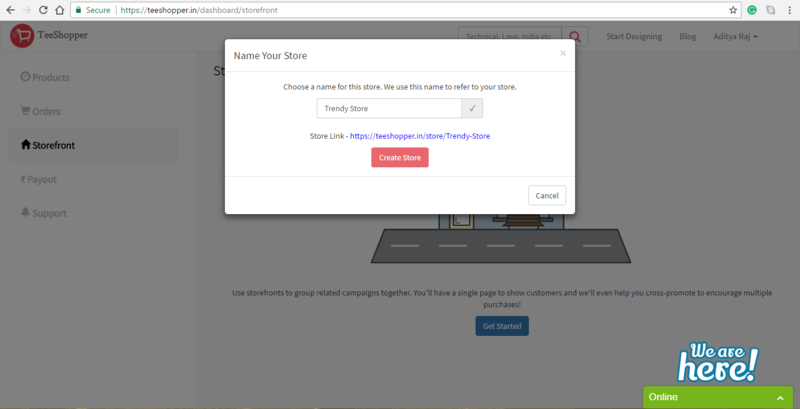 You can see in image there’s a green tick beside my store name, it means store name is not taken by anybody else and now you can click on Create Store Button. Voila, you have created your first Store. 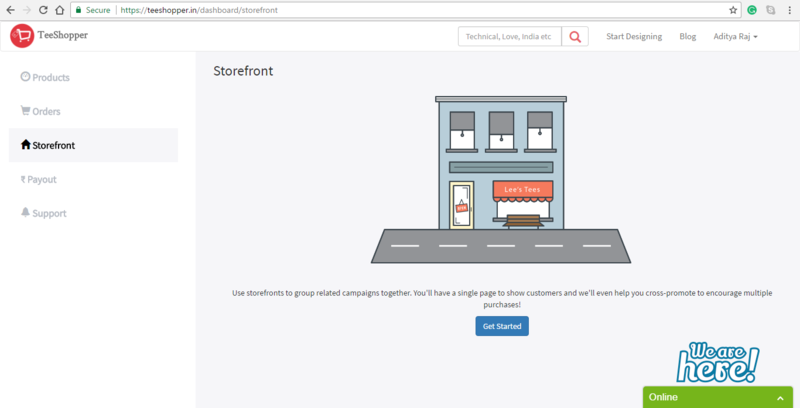 You can create more stores if you want by clicking on blue Create Storefront Link which is on top right side and follow the same above procedures. 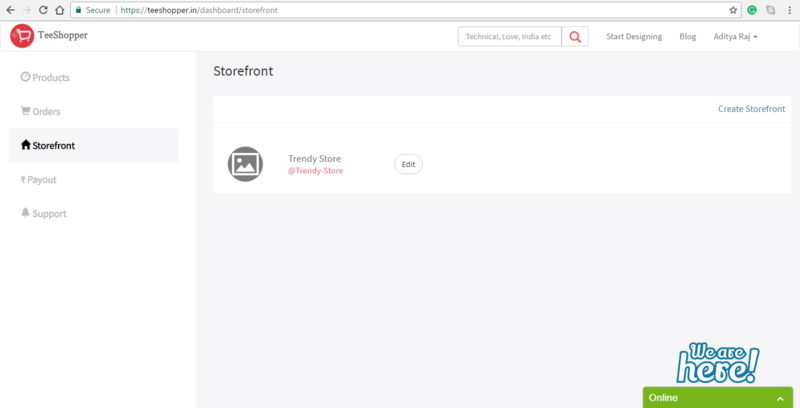 Now, Add Logo and Description of your store by clicking on Edit button which is in right side of your store name. Click on Add/Edit Button and your all Designed products will be visible below. All my designed t-shirts are visible now. 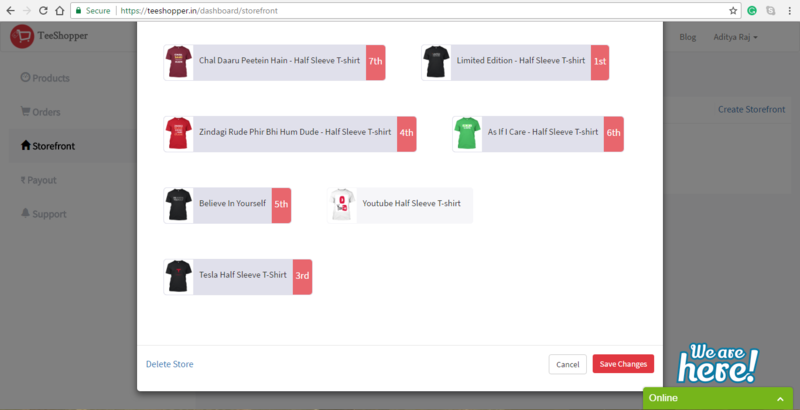 Now, I have to click on those products only which I want to have in my store. I will click on my products according to how I want it in my store. 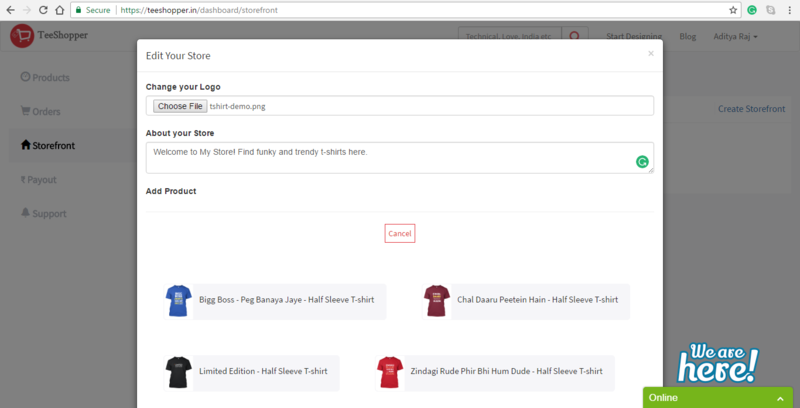 For example – I want my “Limited Edition” T-shirt to be in first position of my store so I will click it first. Here, you can see I have chosen my products. And now, I will click on Save Changes button. Now my Trendy Store is ready to share, where’s yours? Comment Below. Is your Design looking good on TeeShopper? Yes, your design is looking good if you are ready to wear your design and go out with your friends & family. How to design that everybody loves? The answer is NO, nothing can be liked by all. Suppose, you are a teenager and likes bikes, gadgets, night party etc. This is common for all teenager but will this be same for your dad or for an older person? Who would like to buy your designed product? Will they wear and feel proud? Will they recommend to their friends? When you find all answer then you are ready to design. Always find a good niche like doctors, engineers, architect, lawyers, CA, lovers, students etc. Find good quotation on Google, follow big e-commerce facebook page, follow what your friends are liking on FB, and do whatever to be updated with trending designs and quotes. After designing, share your design on social media like facebook, google plus and note how you are friends react and like your design. After getting a good response, you can start the Facebook AD with a good budget.